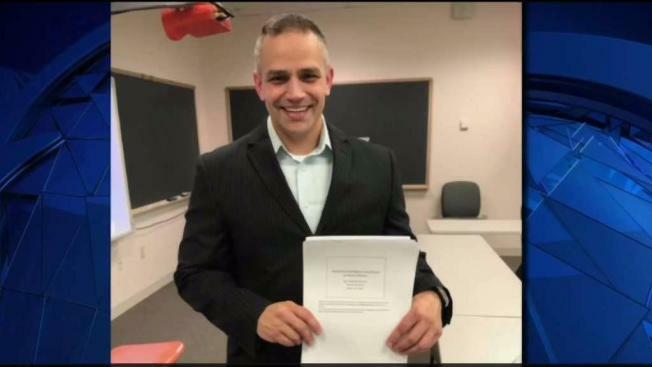 A New Hampshire policeman is now a doctor. A police officer in Londonderry, New Hampshire has a new title. Sgt. Michael McCutcheon, a police officer first, had growing ambitions. "I knew I wanted to be a policeman," McCutcheon said. "I'm always looking for new things to do," said McCutcheon. That curiosity led the Londonderry Sergeant on a unique career path to doctor. "The first time you hear it, it's pretty amazing," he said. Since 2012, Dr. McCutcheon has been in college earning his doctorate. He recently defended his dissertation and it was accepted. "I wanted to look at how we can better serve policemen who are exposed to continuous stress and traumatic events and if emotional intelligence would be something that would help them deal with those events," McCutcheon said. The new doctor joined the police force with his bachelor's degree and went on to gain his master's. From there he kept going despite admitting not having a less than studious start. "Where I am now and where I came from, I wasn't a great student," McCutcheon said. "I wasn't interested." He said criminal justice grabbed his attention and his passion for teaching. "And now I can't get enough," McCutcheon said. This passion motivates him to start his own business on YouTube that takes him all over the country teaching "Forensic Education." "When I created these classes, I had me in mind, you're not going to be able to fall asleep, because it's exciting and it's different than traditional police training," McCutcheon said. Training that gave him the discipline to complete his doctorate in education at Nashua's Rivier University. "I sleep very little, wake up early and go to bed late," he said. He said the support of the Londonderry Police helped him achieve this accomplishment. "The Londonderry police educational program, they helped me get my master's degree," McCutcheon said. "They helped pay for my master's degree and they helped pay for my doctoral program." McCutcheon said even though he's busy with work and his studies, he still makes time for his family and it was also their support that got him through the process. "They made me the most touching cards of congratulations that I received," McCutcheon said. "Pretty amazing that they appreciated how hard I worked." Work, Dr. McCutcheon said, he's just getting started. "I'm looking forward to reaching as many people as possible," McCutcheon said. Dr. McCutcheon said he will receive his doctoral diploma on May 12.